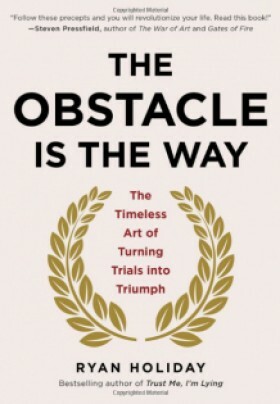 Ryan Holiday’s new book, The Obstacle is the Way, offers a fascinating and well-researched look at the classic philosophers and their lessons on overcoming obstacles. Ryan takes it a step further, however, in laying out practical steps you can take in your business and in your life to not only overcome obstacles but actually embrace each setback and discover the inherent opportunity within every obstacle that you encounter. The book is a handbook for how to be ceaselessly creative in your approach, mindset and results. This is quite likely the one book you will buy other smart people in your inner-circle for the holidays this year. But, don’t wait for the next holiday or birthday as an excuse to gift this book to others. Go buy several copies of this book now and give a copy to anyone you know who wants to get more done with less stress, headache and verbal abuse we give ourselves inside our own heads when we get stuck and can’t seem to find a way around the obstacles in our lives.